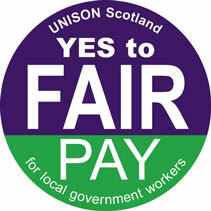 CoSLA has tabled an improved pay offer for local government workers which if accepted will deliver 9.5% cost of living increase over 3 years: 3.5% for 2018-19, 3% for 2019-20 and 3% for 2020-21. UNISON has welcomed the move and its local government committee agreed this morning to ballot our members in the new year, urging them to accept the offer. The improved pay offer has come after months of campaigning and negotiations by UNISON and sister trade unions (GMB and Unite) and years of below inflation pay increases. Johanna Baxter, Head of Local Government (Bargaining) said: “This revised and improved offer would never have been achieved without the resolve, campaigning activity and political lobbying efforts of UNISON members up and down the country. Mark Ferguson, chair of UNISON’s Local Government Committee added: “This offer does not meet all of our expectations but it is move in the right direction after a decade of below inflation increases and job cuts.